We've reviewed our fair share of bars on this blog, and have written about the best whisky bars in Hong Kong and best bars in Sydney before, but when it comes to whisky bars, depsite having visited some amazing ones all around the world, there's still one that ranks #1 in our books - Whisky & Alement, in Melbourne. The variety of their collection. The owners and staff are true whisk(e)y fanatics, and it shows in their incredibly well thought-out selection. ...so when we heard they were opening a pop-up bar focusing solely on Japanese whisky (dubbed "a 6 month Consumable Exhibition of Japanese Whisky"), we knew it was something to be excited about. Introducing, "Bar White Oak". The full press release is below, but all you need to know is that there'll be ~150 Japanese whiskies, and it's open 7 days a week from 18 May, for 6 months, and you should get into it. Oh, and there's a Highball tap! 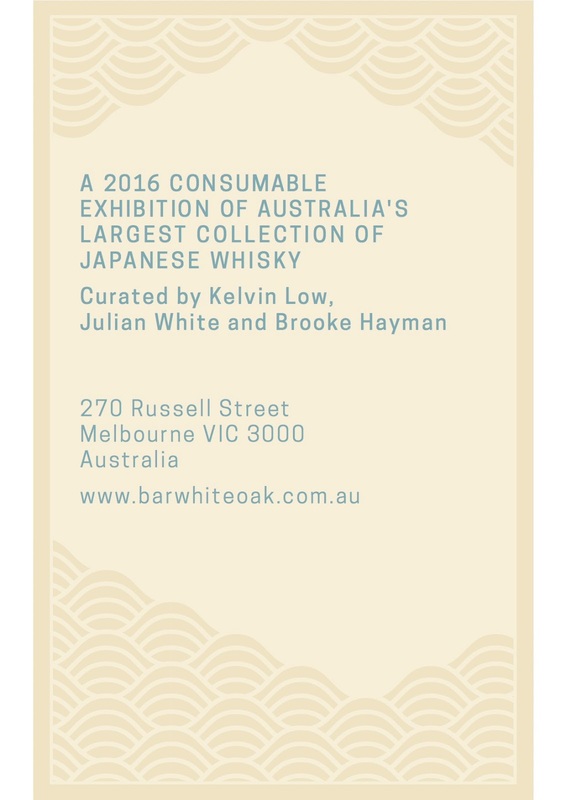 "Whisky and Alement owners, Julian White and Brooke Hayman have teamed up with Kelvin Low (formerly of Heirloom Restaurant) to create a pop-up bar that will serve Australia’s largest publicly available collection of Japanese whisky. The bar will serve up to 150 different Japanese whiskies including rare releases from the demolished Karuizawa distillery, unusual blends of the 1980’s and recent award winners such as the Yamazaki Sherry Cask 2016 release. Open 7 days from 18 May for a limited six-month period, Australia’s only bar solely dedicated to Japanese Whisky has been dubbed a “Consumable Exhibition” to honour the incredible history of Japanese whisky and how it came to carry the value and rarity of today. The bar will offer a rare chance to try Japanese whiskies of the late 20th Century at affordable prices before they become so rare and expensive that they’re reserved only for the cupboard’s of avid collectors. To compliment Bar White Oak’s whisky selection, Whisky and Alement have built Australia’s first, permanent Whisky Highball tap (draught system) similar to those used in bars across Japan. A Highball is ordered as an “in the meantime” drink while everyone is looking at the menu, or to cleanse the palate between flavours as a refreshing, light alternative to beer. 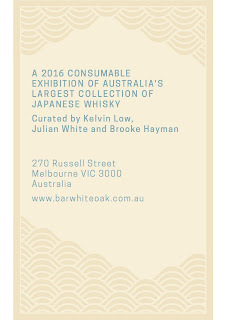 Julian White and Kelvin Low will also be launching a series of Japanese Whisky Tastings during the six-month operation of Bar White Oak. Tastings planned include a Japanese Introductory Tasting, an Intermediate Japanese Tasting, and several different rare Japanese Whisky Tastings. White and Low both intend to add a light element to the events with a little Japanese humor. Dates are expected to be released in early May via the Whisky and Alement mailing list."